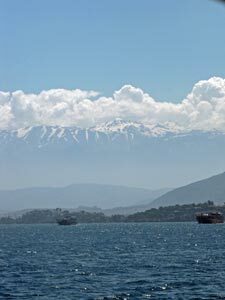 It seemed that the weather pattern of morning sunshine followed by afternoon build-up of thunderheads finally peaked and as we headed down From Eğirdir to Fethiye, via Isparta – the rose oil capital of Turkey - we passed through periods of torrential rain. 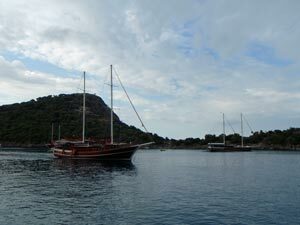 However, by the time we reached the Fethiye Marina just after 7pm, the rain had well passed. 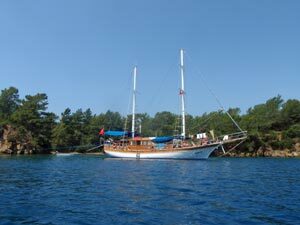 We were about to embark on one of the famous “Blue Cruises” for 7 days of sailing aboard a gulet, the traditional Turkish wooden sailing boat, swimming, visiting islands and coastal towns between Fethiye and Marmaris in south-western Turkey – or so we thought. 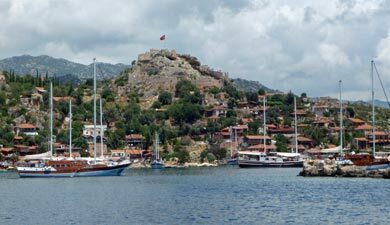 We called in at the office of the yacht company, whose name we had been given and were told that we would not be able to embark as we had to wait for another couple – no problem as the documents said that the boat would spend the first night in Fethiye Harbour. 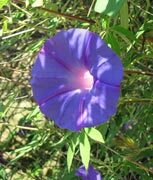 However, when the other couple arrived around 10pm, we all boarded a mini-bus and found ourselves heading, not to the harbour, but out into the mountainous countryside, racing through the dark night around narrow winding roads. 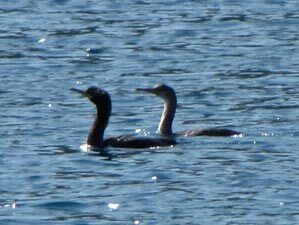 A quick exchange revealed that we were not going to be mugged, but rather had to join the boat in another cove as it had sailed at mid-day. So on we went, down through the old Greek ghost town of Kavaköy to a small bay, barely lit by a thin sliver of moon, where a dinghy awaited on a dark beach. A quick transfer of luggage and four people filled the dinghy and we puttered out into the dark bay, guided by the beam of a torch. 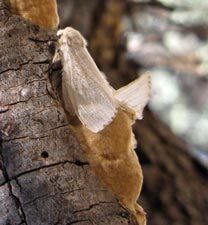 After a few minutes, the beam showed up the shape of a large 2-masted wooden vessel, the “Buket” – we had found our home for the next few days and clambered aboard. The trip certainly promised to be interesting. 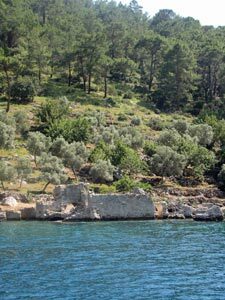 The next morning we were greeted by the other 16 passengers and 4 crew, as well as the sight of St Nicholas Island and its 5th century Byzantine ruins guarding the entry to the pretty little bay in which we were moored. All seemed well until the captain got out his charts to show us the course for the day. 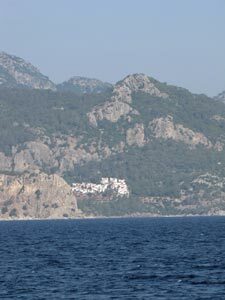 We were heading for Kekova to the east not Marmaris to the west – the yachting agents had registered us on the wrong trip! Underway at last - eastward ho! A couple of phone calls, a few terse words, blame passed from one to another, nothing really to be done and we set sail eastwards. A sense of resignation set in along with that great coping mechanism, rationalisation – our fellow travellers, from Canada, USA, Germany and Australia, were a pleasant and jovial group, the sea and coast would be similar in either direction and by going this way we would actually follow the first part of route of the Lycian Way, even if it was by boat. We would walk the eastern end later. 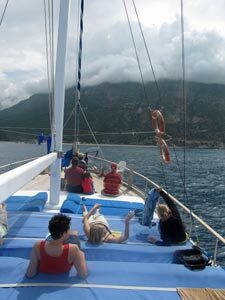 Our first day was a long sail along the sheer Lycian coastline, where arid rocky mountainsides plunge into the intensely blue waters of the Mediterranean. Several clefts in the mountains that revealed deep gorges running inland from the shore, the odd stretch of sandy beach and the occasional town or village marked our passing. It was a day for lazing on the deck soaking up the views and sunshine. Inland the cloud still hung low over the mountains, but out to sea the sun shone brightly, certainly bright enough to transform the fair skin of a couple of our fellow travellers to a painful crimson colour. 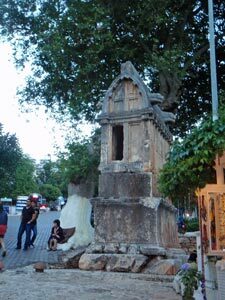 We stopped at Kaş, a picturesque tourist town for the second night, which gave us time to wander about and explore its charms. Having left home with the express intent that we would not buy a Turkish carpet like everyone else, one leapt out from a small shop in Kaş and said “buy me – I am perfect for your study”. After a few apple teas and a bit of one-sided bargaining, we had broken our promise! The saga continued next morning in Kaş, as we waited in port for a couple of hours while our captain had to explain to the harbour master why 16 passengers got on in Fethiye and 20 arrived in Kaş - bureaucracy rules!! 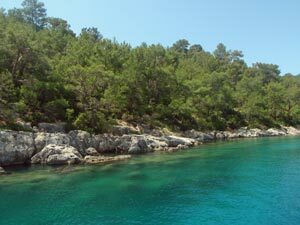 Anyway, we finally got underway again and continued our eastward push along the Lycian coastline. 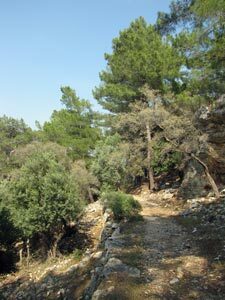 The wind was lighter, the sun was brighter and the scrub-covered rocky hills somewhat less imposing than those of yesterday. We pulled into a quiet bay nearby for a late morning swim in the waters of the eastern Mediterranean – blue, clear and very salty. With the temperature rising it was very refreshing. 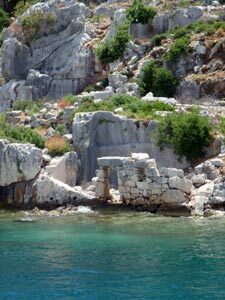 Our gulet set off again, cruising past rocky shorelines and islands to reach the long island of Kekova, site of an ancient Lycian city, the ruins of which stretch along the shoreline of the island, some on land and some partially submerged as the result of a 6th century earthquake. 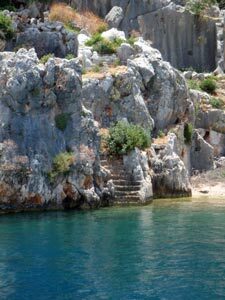 We anchored in the beautiful deep blue harbour of Kekova for lunch and another swim, before going ashore by dinghy to explore the ruins of the old city of Simena with its castle, built by Genovese traders in the 14th century, high above the village of Kaleköy. 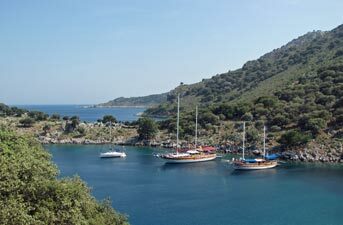 Kaleköy is a picturesque fishing village situated on a rocky peninsula with no road access – all visits by boat only. The views from the castle over the harbour were stunning. 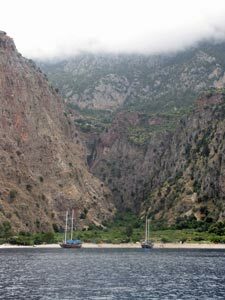 After time to wander through the village, the ”Buket” pushed on a little further to enter the still waters of Kamişlik Bay, where we anchored for the night, protected from the open sea by numerous small rocky islets – a serene setting in which to pass the night. 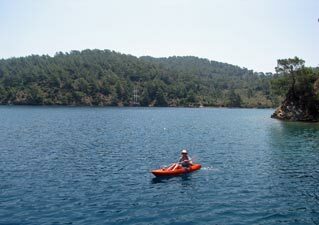 As it turned out it was to be our last night in the “Buket”, as the yachting agency telephoned to say that we should catch a bus back from Demre to Fethiye next morning to join a cruise to Marmaris, our original destination. The strange game of musical yacht trips was continuing. Our last day on the “Buket” was warm and clear. 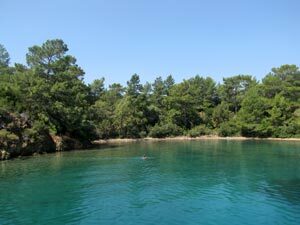 We didn’t travel far from Kamişlik Bay before pulling into a beautiful little cove tucked into pine-covered hills and time for a bit of snorkelling. 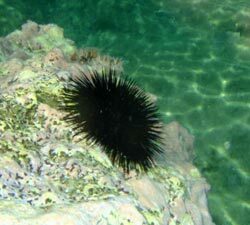 There are parts of the Mediterranean here that seem peculiarly depauperate of marine life – only a few fish and not much on the sea bed. 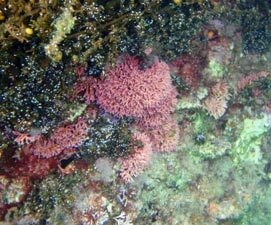 It was like a deep blue desert with the odd patch of soft corals. From here we made the brief crossing to Demre harbour, where after lunch, everyone left the boat. 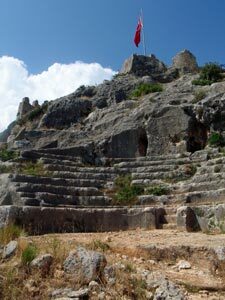 Our little company was scattering to the far corners of Turkey and, after goodbyes all round, the fair Nello and I were taken to the bus station and quickly found ourselves on a 3-hour local bus trip back along the landside of the Lycian coast to Fethiye. For the first time, the organisation seemed to be going smoothly. Reaching Fethiye, we went straight to the yachting agents and were soon transferred to the Marina and the “Jasmin C”, another gulet, smaller but with more spacious and better appointed cabins, which would finally take us in the right direction to Marmaris. 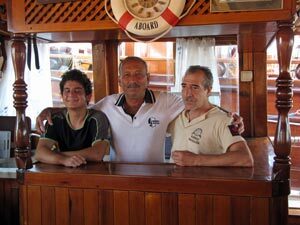 Things were at last getting back to normal and we spent a quiet night on the boat in Fethiye Harbour, getting to know our captain and crew and the five other passengers from Germany, Holland and Belgium. The lingua franca tonight was German, so it was time to drag out the remnants of my high school German lessons, much to the amusement of our new European companions – it was a good start to the last half of our Blue Cruise (mis)adventure. 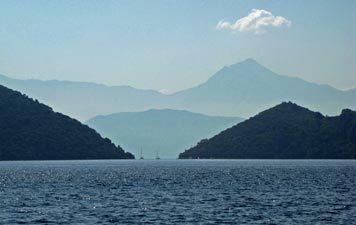 The next morning we were joined by a New Zealand couple, which improved the balance of English speakers, and set sail out into the waters of Fethiye Harbour, backed by distant snow-topped peaks, and framed by green-clad hills. 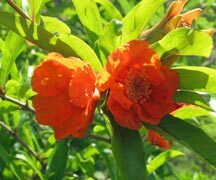 The captain took us across the harbour, tipped with whitecaps in a strengthening breeze, passing a number of shrub-covered rocky islets before reaching a sheltered bay in the western end of the harbour. 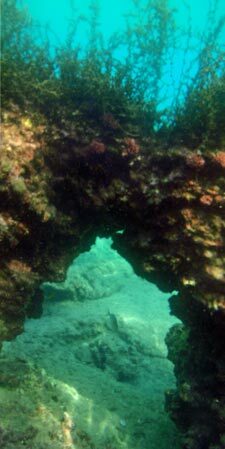 Time for lunch and the usual swim, then a slow sail around the inlets of this ruggedly indented coast-line, passing the ruins of Cleopatra’s Pool, an ancient baths supposedly built for the famous Egyptian queen by Mark Anthony. 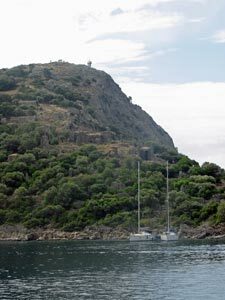 Rounding the end of a long promontory into the harbour, we stopped in its leeward side and moored next to the ruins of a tiny village. 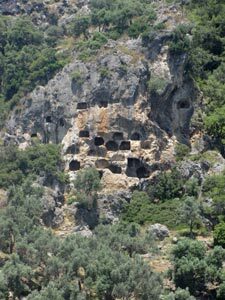 The fair Nello and I filled a dry-bag with sandals, hat and shirts and swam from the boat to shore to climb up through the old olive plantation and crumbling walls of the houses, following a track up past bleating goats to the top of the ridgeline. 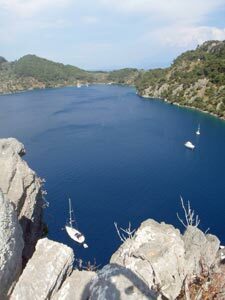 Here, at the site of an old Lycian tomb, we could look down onto the yachts moored in secluded coves below and out across the harbour to blue on blue fading mountains beyond. It was the perfect place to spend the night and get to know our new friends better. The captain even brought out a round of raki for everyone – he had learnt that he had just become a grandfather, and it was a good time to celebrate the arrival of little Melech. Despite our initial misadventures, things were looking good – as the French say “on est bien tombé”. 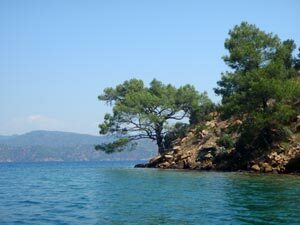 As they say it was “just another day in paradise” – a cloudless blue sky, an early morning dip watching a squirrel cavorting on the trunk of an old olive as we floated in the clear blue water of Fethiye Harbour. Today we would continue our exploration of the superb western end of this harbour with its deeply indented shoreline, promontories, islands, channels and coves. 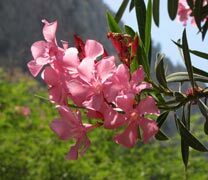 This trip has been a very different one to the cruise to Kekova, which closely followed the Mediterranean shore – a dramatic landscape where mountains plunge into the sea. 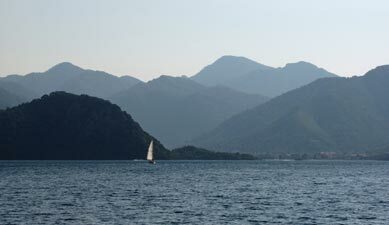 Here we were in a softer landscape, with broad reaches of water framed by the hazy blue of distant mountains, with a foreground of the pine-covered slopes of coves and nearby islands. Our day was spent cruising between beautiful anchorages, a bit of kayaking, a bit of swimming, a bit of lazing about on deck listening to the cicadas in the nearby pines, watching the passing parade of boats – wooden gulets, yachts of various sizes, large luxury launches, small fishing boats, the ice-cream boat (two magnums, please) and others. 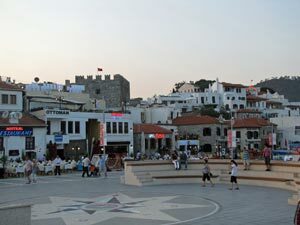 Fethiye Harbour is a busy place, but big enough to absorb all the craft and offer a sense of escape from the grind of the world beyond. After another swim to shore and brief foray on land, climbing up through the pine and oak of a narrow peninsula for more views of the little bays and inlets that line this beautiful harbour, we settled in for the night. 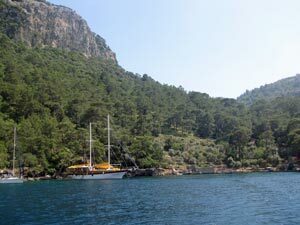 Our evening passed in a sheltered cove that soon became home to several other yachts and gulets. Fish barbecued on deck for dinner, followed by a night of dancing beneath the stars to the songs of yesteryear ….. the Jasmin C was turning into “The Boat that Rocked”. As I said before, “just another day in paradise”. 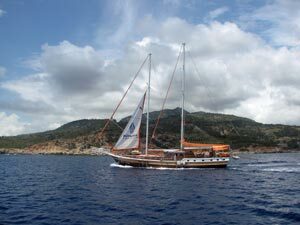 The gulet’s powerful diesel engine cranked up at 5am and we inched out of our sheltered cove to leave Fethiye Harbour and all its charm behind and bore on across the open sea for four hours towards Marmaris. The Jasmin C pitched and rolled its way across the big swell, as we tried to sleep to the deep throb of the motors. 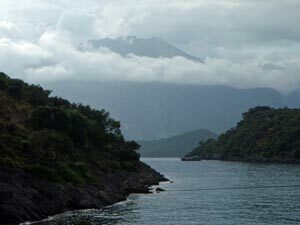 Eventually we gave up and headed out on deck to watch the passing mountainous shoreline. 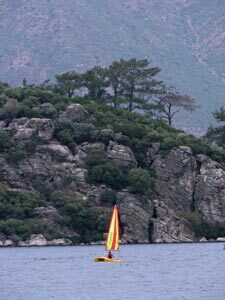 At 9am, we pulled into the protected waters near the small resort of Turunç, set on a stony beach, at the base of a rugged promontory that jutted out to the west of Marmaris Harbour. Breakfast over, we pushed on into the harbour, its entrance guarded by high rocky hills, to find another quiet anchorage inside. It was a strange day with high cloud dulling the brightness and a feeling of lethargy replacing that of relaxation. It took quite an effort to get up and go for a swim, despite the clarity and colour of the water. Perhaps it was just as well this was our last day of the cruise. Finally, we headed into Marmaris Marina to spend our last night there. 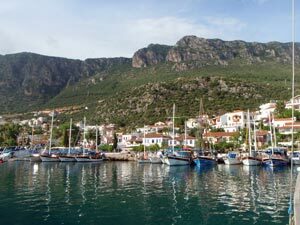 After our captain reversed the 24m long 6m wide gulet into a space 7m wide without touching either neighbouring vessel, we gave him a round of applause and set off to explore this small port city. 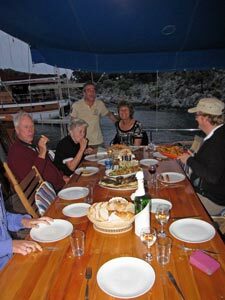 One last dinner and one last breakfast to enjoy the company of our fellow passengers and the crew and we were off again, on a local bus back to Fethiye for a couple of days to catch up on correspondence, washing etc. 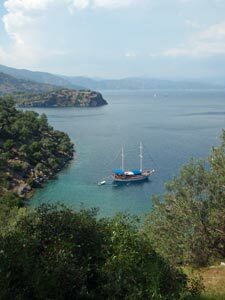 Phase 3 of our travels in Turkey was over and, despite a shaky start, we had enjoyed our Blue Cruise(s) immensely. 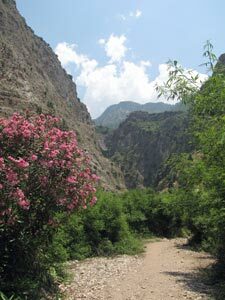 With a day up our sleeve in Fethiye, we decided to visit nearby Kelebekler Vadisi (Butterfly Valley) a must-see location on the backpacker circuit of Turkey. Catching a dolmuş in town, we soon found ourselves climbing over the western slopes of Baba Dağ and passing through the hyper-touristic villages of Ovacik and Hisarönü. From the accents and signs, this part of the world is a “little England” – chip butties or Yorkshire pudding anyone, they are both on the menus of the local Turkish restaurants. Ovacik has one other claim to fame of greater interest to the fair Nello and myself. 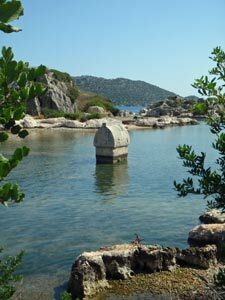 It is the starting place for trekking the Lycian Way, but more of that in the next section. 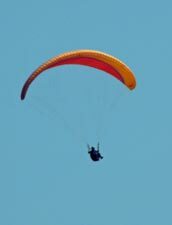 A steep descent brought us to the modern resort town of Ölüdeniz, with its long deckchair dotted coarse sand beach and skies filled with parapentists that had launched from high up the slopes of Baba Dağ. 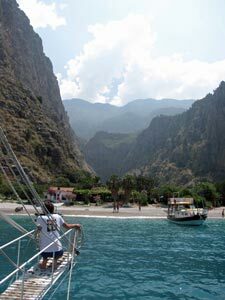 The fair Nello and I ignored the touts on the tourist boats (waterslides, barbecues on board, duff duff music etc etc) and caught the little 11am ferry for the half hour boat trip from Ölüdeniz to Butterfly Valley. 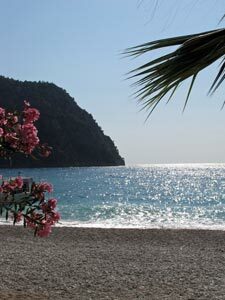 Few places would have such a dramatic entry, as you round the rocky slope that plunges into the Mediterranean from the mountain above to be greeted by a deep cleft in the mountainside, with 400-500m cliffs hiding a small bay and grey sand beach. The tiny valley backing the beach, lush with flowering shrubs and small fruit and vegetable gardens quickly funnelled into a narrow chasm, at the back of which a waterfall tumbled down from the cliffs above. 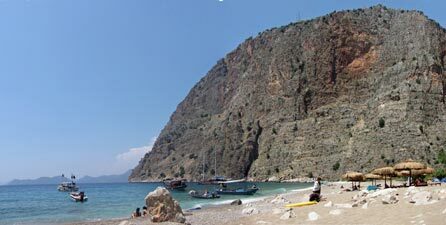 The tourist boats all landed here at much the same time, but within an hour were gone, leaving Butterfly Valley and its laid-back residents basking in an indolent retro-hippy ambiance – a great place to spend an afternoon exploring the chasm and waterfall, lazing on the coarse grey sand or swimming in the cool green sea. The only disappointment was that we only saw half a dozen butterflies, a token number given the valley’s name. We did notice that there were large numbers of buddleia not quite in flower in the valley, and given that these are commonly known as butterfly bushes, for their attraction to lepidopterans, we were probably a week or two too early. 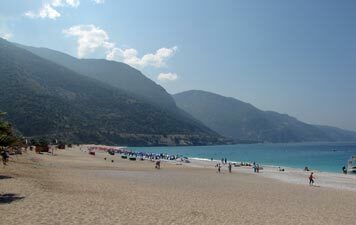 Never mind, it was a day well spent and, as we puttered back on the ferry to upmarket Ölüdeniz, we agreed that it may have only been half an hour away by boat, but it was a world apart from the chip butties and Yorkshire puddings of “little England”.